Keep the focus on Jesus and not on ourselves. That’s my advice this week, as you’ll see in the below video contribution to An Ignatian Prayer Adventure, Week 6. My three favorite words in any language are, “O felix culpa—O happy fault.” I talk about why in today’s video, part of our discussion of sin in this Week 3 of An Ignatian Prayer Adventure. Visit the Ignatian Prayer Adventure page for links to the third week’s full set of materials. Welcome to Week 2 of An Ignatian Prayer Adventure. In today’s video, I talk about desire and praying for the grace that you desire. 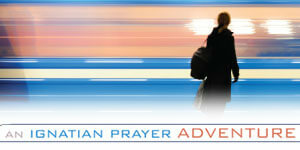 Visit the Ignatian Prayer Adventure page for links to the second week’s full set of materials. We begin An Ignatian Prayer Adventure this week. Watch the video below for my introduction to the retreat. In order to respond to God’s love, we need to be spiritually free. May we grow in that freedom as together we experience this journey over the upcoming weeks. This video is part of An Ignatian Prayer Adventure, Week 1.